The Primrose Brook subwatershed is the second smallest of our subwatersheds and covers just over 5 square miles. 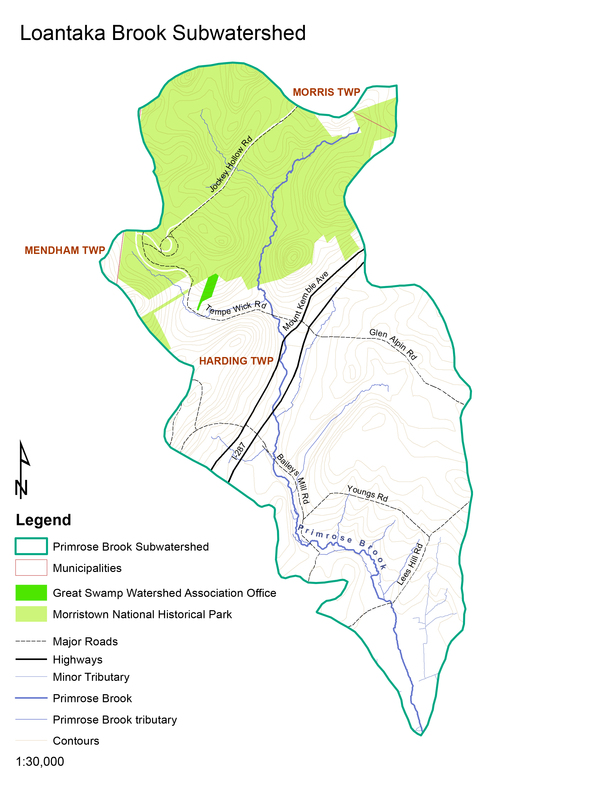 Primrose Brook has three major tributaries that feed the main brook. The westernmost tributary begins in Mendham, west of Tempe Wick Road along the intersection of the Morris Area Girl Scout property and Morristown National Historical Park’s Jockey Hollow. It crosses over Tempe Wick Road to join the second tributary south of Jockey Hollow before once again crossing over Tempe Wick Rd just above Route 202. The second tributary begins within Jockey Hollow and is the most protected and pristine waterway in the subwatershed. This section of Primrose, which NJ DEP has labeled as a Category 1 Trout Producing stream, runs through Jockey Hollow for over a mile before joining the first tributary south of the park. The third tributary begins south of Route 202 off Meadow Lane near the back of the Harding School property. It then flows south-west into Mount Kemble Lake and joins the mainstem of the stream south of Bailey’s Mill Road. Primrose Brook flows through some of the least developed areas within the Great Swamp Watershed. After the third tributary joins the mainstem of the brook, it meanders back across Bailey’s Mill Rd and into the Great Swamp National Wildlife Refuge, where it joins with Great Brook before finally meeting up with the Passaic River just east of Somerset County’s Lord Stirling Environmental Education Center. As Primrose Brook flows through the Jockey Hollow section of Morristown National Historical Park, there are many trails that follow along its length where hikers can observe fish and waterfowl. The park provides protection for the stream, with only a few paved roads disturbing the natural landscape. Primrose Brook, along with Black Brook, were the focus of GSWA’s latest “Adopt-a-Stream” program. From 2014 through 2016 increased water quality monitoring efforts were focused on these areas of the watershed, collecting data at additional locations to monitor the overall health of the brook. Primrose Brook continues to be one of our most healthy streams. The 2015 Great Swamp Watershed Report Card results (link) showed that Primrose Brook, as well as the Mount Kemble Lake tributary, met or exceeded all the water quality parameters monitored. Nutrient levels, nitrogen in particular, have even improved from previous years. The results show that properly managed buffer areas and minimal impervious surface in the sub-watershed have a definite positive impact on the overall water quality.